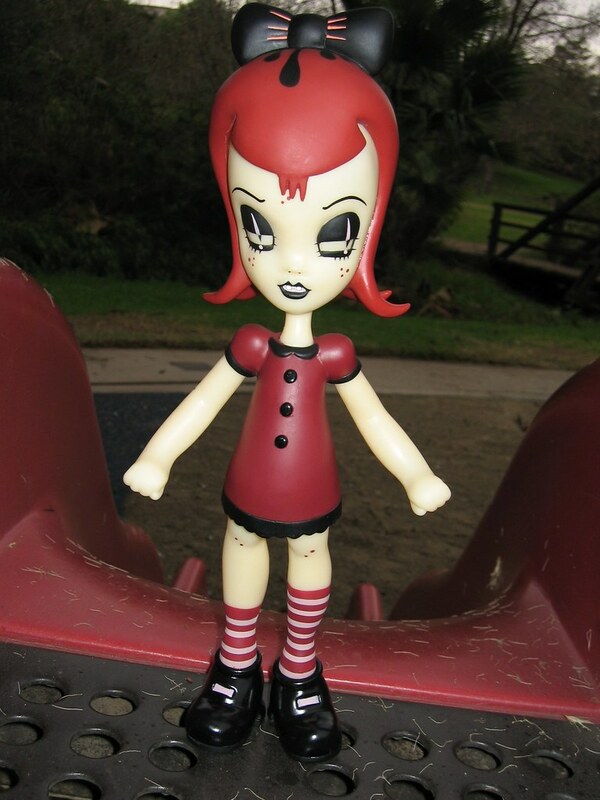 A few months ago, at her show "The Saddest Place on Earth", Camille Rose Garcia revealed her first set of vinyl toys by Necessaries Toy Foundation. The 4 sister dolls set consists of Cherry, Lulu, Patch and of course the conjoined twins Katie and Sadie. At 14 inches tall, they are among the most impressive toys within my collection. However, to some collectors, their height may have been the source of their stability problem. Some collectors also have concerns with the glue marks on the toys. With further inspection of my set, there are some slight glue marks and Katie/Sadie's middle foot is shorter. With some effort I managed to prop her up sturdily. One point I would like to make about the dolls is the wonderful color scheme they are painted in, which brought out each doll's playful personality. 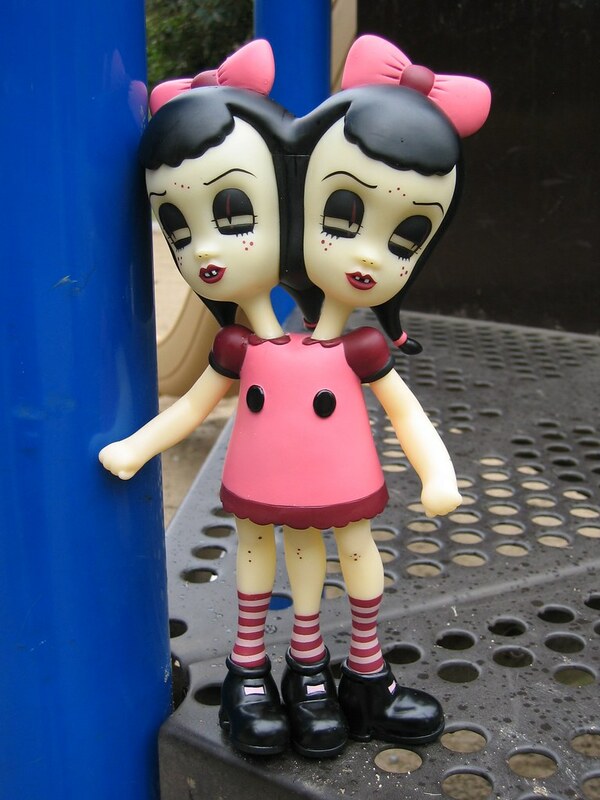 These dolls are definitely keepers since they may be Camille's only ever vinyl toys released. 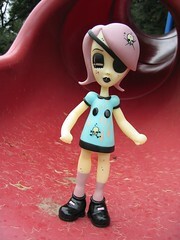 Being environmentally conscientious, Camille has expressed that she may not make any more vinyl toys in the future. So, you must get at least one of the dolls if not the whole set. Or you may be a lucky winner in a VP contest coming soon. It was raining through out New Year's weekend but I managed to sneak in a few no-rain moments with the dolls at a local park. Take a look at the sisters taking their turns on the slides!!! Hello, THESE ARE SO BEAUTIFUL. How come no one in the media is talking about them. Thank you for opening my eyes to them. I love VP 4 E ! so if her drawings and dolls aren't my favoirte things ever. i don't know what are. Definitly are so beatiful and strange, I really want to know what the artist thought for create them. I have known you for what? 100 years now.I hope your getting everything you want out of life. Your mother has been a mentor and a friend and all of you will hold a place in my heart.